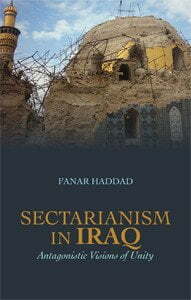 Fanar Haddad has written a valuable book on the controversial issue of sectarianism in Iraq. Haddad’s main concern is to combat two opposing oversimplifications that too often dominate discussions of the subject. On the one hand, those promoting Iraqi nationalism promote the myth that ‘we are all brothers’—in other words, that sectarianism is not really an Iraqi problem at all, and that apparent evidence of it is merely the result of foreign plots. Haddad quickly shows the inaccuracy of this myth, pointing out that it is merely an example of the conspiracy theorizing so popular in the Middle East. This myth is also the result of a sort of Iraqi political correctness: in Iraq, ‘sectarianism’ is a pejorative word, so to accuse someone of it is an insult or an attack. Fanar Haddad. Sectarianism in Iraq: Antagonistic Visions of Unity. London: C. Hurst and Co.; New York: Columbia University Press, 2011. ISBN: 9781849041287 (paperback, £25.00); 978-0-231-70232-4 (cloth, $35.00). The opposite oversimplification is that sectarianism in Iraq is a sort of ancient communal hatred, bone-deep, immutable and irreconcilable; and that Iraqi nationalism is either dead, or was fictional all along. The truth, Haddad argues, is that Arab Sunnis and Shi’a alike embrace the notion of an Iraqi nation, but they disagree bitterly over how it is to be defined. This is the point of Haddad’s subtitle. Who, for example, are the national heroes? Shi’a dislike pan-Arab—i.e. Sunni—heroes such as Saladin or the Caliph Harun al-Rashid; while when Shi’a hoist pictures of top clerics as national symbols, Sunnis see ‘turbans’ and dismiss them as ‘Persians’—enemies of the nation, not symbols of it. One strength of Haddad’s treatment is his decision to draw insights from a range of theories of ethnic conflict without getting bogged down in the disputes among the theorists. These include theorists who have written specifically about Iraq or Arab sectarianism such as Ussama Makdisi, Rashid al-Khayoon and Andreas Wimmer; and more general theorists of ethnic conflict such as Anthony Smith, Vamik Volkan and Stuart Kaufman (the current reviewer). In Chapter 2, “Approaching a Theory of Sectarianism,” Haddad identifies four key ‘drivers of sectarian identity’ (10): external influence, economic competition, competing myth-symbol complexes, and contested cultural ownership of the nation. The centerpiece of Haddad’s contribution is to emphasize the fact that sectarianism can take more or less contentious forms, which he distinguishes as assertive, passive and banal sectarianism. Sectarian identity, Haddad notes, like other ethnic identities, is often “banal (27);” a social fact that is ignored, or a private prayer said with no social impact. At other times, sectarianism is “passive,” (26) as in the routine performance of public religious rituals in a way meant not to challenge other groups. Sometimes, however, people engage in “assertive sectarianism,” loudly proclaiming the rightness of their own beliefs or, in the “aggressive” version, provocatively denigrating other groups or their beliefs (25-26). The effect of the various drivers of sectarian identity is that these factors may push people to shift their behavior from banal or passive sectarianism to the more assertive or aggressive form that leads to political contention or, at worst, violence. From the perspective of political science, Haddad’s work is at its heart ‘constructivist,’ focused on the effects of discourses—myth-symbol complexes, nationalist ideologies, and so on—in driving social behavior. A valuable contribution Haddad makes is to shift attention from elite discourses of politicians and national media downward to expressions of grassroots leaders and popular culture. This shift is essential, because different expressions occur at different levels: national politicians tend to emphasize the pieties of national unity; it is at the grassroots or ‘street’ level that sectarian hostility is expressed. The list of epithets Haddad uncovers, articulated by each group against the other, vividly illustrates sectarian tensions. Sunnis, for their part, often dismiss Shi’as as “Safavids” or “Persians” (154); or else as “sha’abi” (roughly, anti-Arab) (44) or “shrugi” (uncultured) (57, 102). Shi’as, especially in the context of the recent violence, variously denounce Sunnis—not just activists, but sometimes all Sunnis—as “Wahhabis” (188) “Ba’athists” (154), “gangs of terrorism” (157) or “nasibi” (defamers of the House of the Prophet—i.e. the line of Shi’a Imams) (191-92); Sadrist anthems go further into dehumanization by calling Sunnis “snakes” (157) and “dogs” (173). The book is not a comprehensive work of history, but rather is focused on tracing the evolution of Shi’a and Sunni myth-symbol complexes, and their relations to each other and to nationalism, primarily over the course of the last two decades. In Haddad’s estimation, the uprising of 1991 was a pivotal turning point, not only for the events themselves, but especially because of the competing interpretations that have arisen. Sunnis tend to believe the Ba’athist regime’s propaganda that that uprising was primarily the work of infiltrators from Iran and of ordinary local hoodlums. For Shi’a, in contrast, the experience has assumed an important place in their myth-symbol complex as both a “chosen glory”—a glorious intifada aimed at overthrowing the Ba’athist tyranny—and a “chosen trauma” (85) for the savage way in which it was repressed. In tracing these changes, Haddad does not overlook the material causes of changing sectarian relations. The Iranian revolution, Haddad notes, did much to put sectarianism on the Iraqi agenda, as did the pervasive anti-Shi’a discrimination of the Ba’athist state including both economic discrimination and the banning of some Shi’a religious rituals. The Iran-Iraq war of the 1980s raised the profile of sectarianism even further. For example, official propaganda referred to the “Persian Zoroastrian enemy,” (51) thereby denying the Islamic character of the Shi’a Iranians—and, by extension, that of Iraq’s Shi’as as well. The international sanctions regime of the 1990s further contributed to the rise of sectarianism: as the sanctions weakened the state, Saddam’s regime began patronizing tribal and sectarian leaders in an effort to maintain political support. One of the leaders thus patronized was Mohammed al-Sadr, who promoted Shi’a-Sunni unity but nevertheless came to be a symbol of Shi’a identity—a symbol his son Muqtada was to use for his own purposes in the post-2003 period. Haddad reasonably enough classifies the events of 2006-07 as a civil war, applying Kaufman’s symbolic theory of ethnic war (among others) to explain its causes. Thus the war resulted, first, from the post-2003 “political and security vacuum” (184) that gave sectarian groups the opportunity to mobilize, combined with the mutually-hostile myth-symbol complexes discussed above and fears of group extinction, with both sides painting themselves as the victim of the other’s sectarian hostility. These conditions then enabled “mass hostility, a political climate dominated by extreme symbolism and a security dilemma” (184), resulting in an escalating spiral of violence. The key turning point in sparking the escalation was the 2006 bombing of the al-Askari shrine in Samarra, a symbolic attack on Shi’a identity that kicked off the worst phase of Iraq’s civil war violence. Haddad notes that no civil war is exclusively ethnic—local rivalries and feuds, economic motives and criminality usually play a role—but he maintains that in Iraq, “the clash was primarily political and symbolic” (181), with elements of territorial conflict in the cases of expulsions from mixed areas. The conflict was not primarily about religion per se, but about historical interpretations: disputes over symbols of sectarian identity and their place in Iraqi nationalism. In making his case, Haddad is generally convincing, and he has provided an important service both in compiling his evidence of Sadrist anthems and other politicized popular culture; and in affording his sophisticated analysis of the causes of the clashes. Though he does not explicitly do so, the implications of his analysis also shed light on debates over past U.S. policy for Iraq. For example, though he agrees that U.S. policy in 2003-04 unwisely emphasized the sectarian divide, he is clear that the resulting conflict cannot be blamed primarily on that factor—though the sanctions of the 1990s did play an important role. Similarly, his vivid portrayal of the visceral anti-Americanism of both Sunnis and Sadrists raises serious questions about whether any U.S. president would have been able to negotiate a continued U.S. presence in Iraq after 2010, especially given Prime Minister Maliki’s reliance on Sadrist support. Haddad notes that a detailed history of the Iraqi civil war has yet to be written. He nevertheless makes a useful contribution as scholars begin the process of sorting out the parties’ rhetorical justifications for what they were doing. The main criticism of the book, from the perspective of this reviewer, is its relative lack of historical background. Readers who are not expert in Arab and Iraqi history would have benefited from an early chapter that summarized the key events referred to in various sectarian myth-symbol complexes and offered a more coherent presentation of those narratives themselves in order to help set the stage for the later analysis. While Haddad does provide explanations of most of these references in footnotes, it is awkward to constantly be constantly flipping to the back pages to get the explanations of what the quoted texts are referring to. This is, however, a fairly minor complaint about an extremely valuable book. Anyone who wishes to understand the events in Iraq in the last two decades, to evaluate U.S. policy there, or to find useful clues about Iraq’s future, would do well to consult Haddad’s penetrating and even-handed analysis. Stuart J. Kaufman is Professor of Political Science and International Relations at the University of Delaware. He taught at the University of Kentucky from 1990 to 2004, and spent 1999 on the U.S. National Security Council staff. He is author of Modern Hatreds: The Symbolic Politics of Ethnic War (Cornell University Press, 2001), and co-editor of The Balance of Power in World History (Houndmills, England: Palgrave MacMillan, 2007), with Richard Little and William C. Wohlforth. Kaufman is also the author of numerous other writings on international security affairs, ethnic conflict, Soviet and post-Soviet affairs, and international relations. He earned his B.A. from Harvard University, and his M.A. and Ph.D. from the University of Michigan. Ussama Makdisi, The Culture of Sectarianism: Community, History and Violence in Nineteenth-Century Ottoman Lebanon (Los Angeles: University of California Press, 2000); Rashid al-Khayoon, Al-Mogtama’a al-Iraqi Turath al-Tasamoh wal Takaroh (Iraqi Society: the heritage of tolerance and hate) (Baghdad: Ma’ahad al-Dirasat al-Strategiya, 2008); and Andreas Wimmer, “Democracy and Ethno-Religious Conflict in Iraq,” Survival 45, no. 4 (Winter 2003-04), pp. 111-134. Note, however, that Wimmer is also well-known as a general theorist of ethnic conflict. Anthony D. Smith, Chosen Peoples (Oxford: Oxford University Press, 2003); Vamik Volkan, Blood Lines: From Ethnic Pride to Ethnic Terrorism, 2nd ed. (Boulder, Co: Westview Press, 1998); and Stuart J. Kaufman, Modern Hatreds: The Symbolic Politics of Ethnic War (Ithaca: Cornell University Press, 2001). Haddad quotes my definition of a myth-symbol complex: “The core of the ethnic identity is the ‘myth-symbol complex’—the combination of myths, memories, values, and symbols that defines not only who is a member of the group but what it means to be a member. The existence, status and security of the group thus come to be seen to depend on the status of group symbols, which is why people are willing to fight and die for them—and why they are willing to follow leaders who manipulate those symbols for dubious or selfish purposes” (Kaufman, Modern Hatreds, 25. I base the concept in turn on Anthony D. Smith, The Ethnic Origins of Nations (Oxford: Basil Blackwell, 1986), 15-16 and passim. On the notion of “banal” nationalism, Haddad cites Michael Billig, Banal Nationalism (London: Sage, 1995). Haddad borrows the concepts of “chosen traumas” and “chosen glories” from Volkan, Blood Lines.